You can download the handout of Saturday's presentation here or by clicking the image. 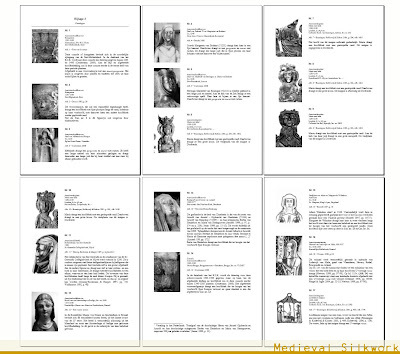 The first six of over 60 pages of catalogue. The catalogue will contain over 170 works of art and objects that feature frilled veils. It will be added to my final thesis as an appendix. 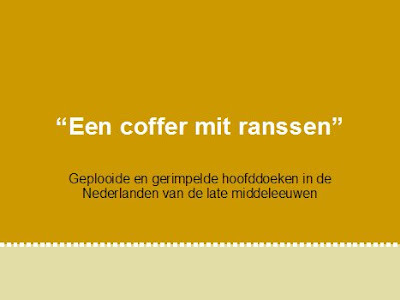 I will also put the handout of my presentation last Saturday online this week, so that everyone who wasn't there can download it. 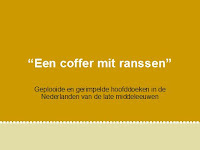 It is written in Dutch but is has 30 pictures on only 8 pages to explain the text! Needles4all organizes workshops and short courses in several locations in the Netherlands on a regular basis. Workshops/courses are announced on the Needles4all website and open to anyone who likes to embroider. Needles4all's workshops and courses include: gold embroidery, needlebinding, smocking, blackwork, and more. This centre for creative arts offers a course in gold embroidery, taught by Ulrike Müllners, a professional textile conservater/restorator. "A chest with ranssen [=frilled veils]"
The name of a piece of female dress made of one or another fine fabric, probably a synonym of hovetcleet [=headdress], namely a bonnet or cap, that fals in folds from the face to the shoulders. 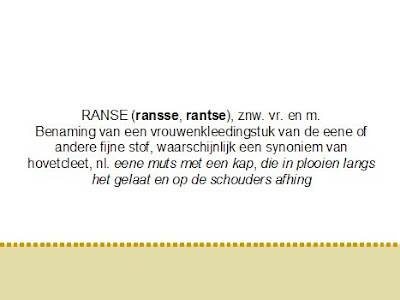 -> This is the definition that is given to the word 'ransen' in the Middle Netherlandish dictionary by Jacob Verdam. 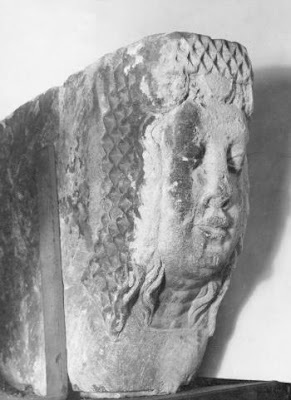 Early examples of frilled headwear. 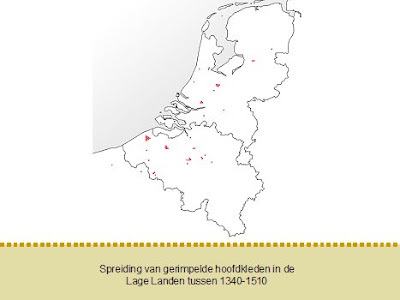 The places where examples of frilled headwear can be found in the Netherlands. Every dot stands for one iconographic example. The veils themselves didn't always change much during the years. It is rather the hairdo's that change, so that a rather different image appears. These three sculptures from Ghent once belonged to the mantlepieces of old townhouses across the city. They all wear a frilled veil and a crown-like thingy underneath it. 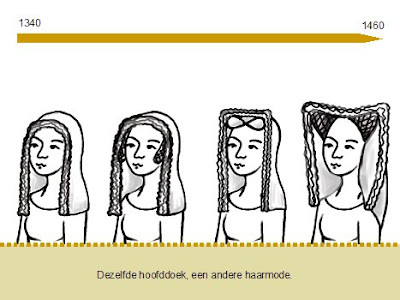 The women on the first and last pic are wearing their hair loose, the middle one wears it in short braids. I have only seen these in the Ghent-region and not anywhere else. So they might be a very local fashion. Has anyone ever seen anything like these crown-like things before? They seem to be made from semi-circular rosette like pieces is some kind of metal. They might be completely circular and then partly covered by the veil so that what you see is only part of the crown. 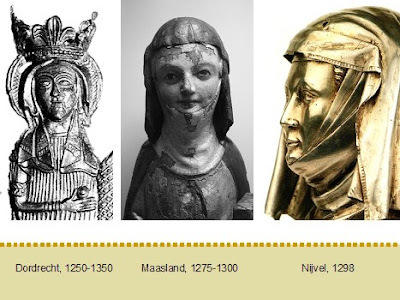 I'm anxious to know wether anyone of you has ever seen these from other places than Ghent en if you have maybe come accross archaeological finds of metal jewelry that resemble the crowns on these sculptures. In the mean time I'm preparing a small lecture about frilled headwear for the LHO (a medieval reenactment society) on Saturday. It will be a good excercise in preparation of my thesis defendance in June. I'm still writing crazy, so many pages still have to be put on paper before mid May!